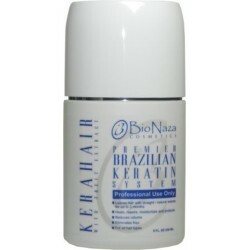 Bio Naza Kerahair Premiere Keratin System 8 Oz. 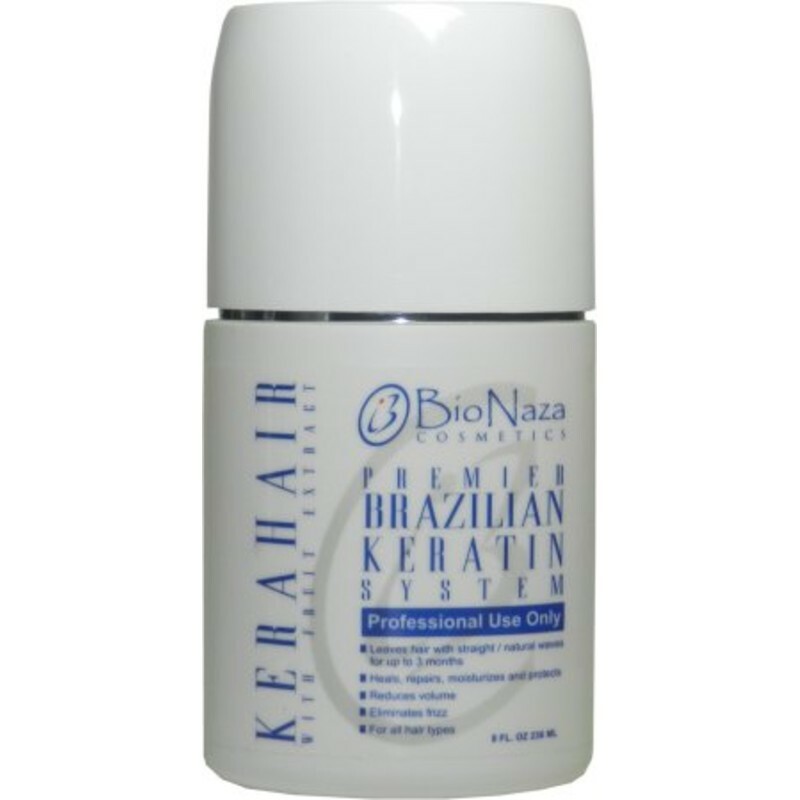 - Just Beauty Products, Inc.
> Hair Products>All Keratins>Bionaza Keratin>Kerahair>Bio Naza Kerahair Premiere Keratin System 8 Oz. The KeraHair Premiere Keratin System is a revolutionary hair reconstructor and volume reducer treatment that eliminates frizzy hair, leaving it straight or wavy, healthy and shinning for up to three months. It works on all kinds of hair, differing only in the way it is applied. Considering the way it works, we could call it a Deep Leaving Conditioner in which the major ingredient is keratin extracted from human hair. 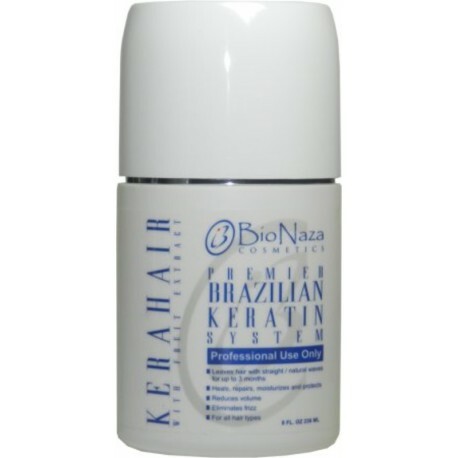 KeraHair- Premiere Keratin System was developed and being used by its developer since the early 2001 and is now on its third and improved version. Today you can color, highlight and wash the hair on the same day the treatment is applied. You can wash your hair with shampoo and conditioner, swim, and go to beach on the same day, without being afraid of losing the effect of KeraHair- Premiere Keratin System. Wash the hair with a deep cleansing shampoo to remove all styling products and to open the hair cuticle. Towel dry the hair. Divide the hair in 4 to 5 sections, Apply KeraHair on each section. You may have to take smaller sections of each division to assure that every strand of hair receives the treatment KeraHair. Blow-dry with a round/paddle brush. Very important each section is completely brushed and blow-dried. Divide again the head in 4 to 5 sections and flat iron each section to seal the keratin into the hair, style as desired. May use styling tools of any kind or silicon/oil drops. Caution: This product may contain ingredients, which may cause skin irritation to certain individuals and a preliminary reaction test, (drop behind the ears for 5 minutes), must be performed. If a reaction occurs (redness of skin), DO NOT apply this treatment. The professional applying this product should wear gloves and avoid contact with the eye. If contact with eyes is made, wash the eyes with plenty of water and call your doctor. Ingredients: Water, Cyclomethicone, Cocos Nucifera (Coconut Oil), Olea Europea(Olive Fruit Oil, Certylesters, Arachis Hypogae (Peanut) Oil, Ricinus Communis (Castor) Seed Oil, Sorbitol, Silk Animo Oil, Polyacrymide, C13-14 Isoparaffin, Laureth-7 DMDM Hydantion, Hydroxyethycellulose, Stearalkonium Chloride, Hydroxyethylcellulose, Cetearyl Alcohol, Amodimethicome, Octoxynol-40, Isolaureth-6, Propylene Glycol, Premiere Keratin System (Keratin Amino Acids 150 M.W. ), Dimethicone PEG-8 Meadowfoamate, Magnesium PCA, Zinc PCA, Manganese PCA, Vitis Vinifera (Grape) Seed Oil, Oenothera Beinnis (Evening Primorose) Oil, Sosa Canina (Rose Hips) Fruit Oil, Simmondsia Chinensis (Jojoba) Seed Oil, Panthothenic Acid (Vitamin B5), Ceteareth-5, Methyl Gluceth-20, Magnesium Sulfate, Panthenol, Citric Adcid, Methylyparaben, Propylparaben, Benzyl Benzoate, Benzyl Salicylate, Limonene, Linalool, Yellow 5 (CI 19140), Red, Cyclopentasiloxane, Cylamethicone, Dimethicone, Phenyl Trimechicone, Aloe Barbadensis Leaf Extract, Triticumvulgare (Weat) Germ Oil, Canola Oil (Canola, Huile de Colza), Prunus Amygdalus Dulcis (Sweet Almond) Oil, Carthamus Tinctorius (Safflower) Seed Oil, Ricinus Communis (Castor) Seed Oil, Ethylehyxl Methoxycinnamate, Hydroxysioheyl 3-Cyclohexenecarboxaldelnyde and Fragrance.